The Amazon Echo Show is set for release in the US on the 28th June although there is still no release date in the UK, and is to be priced at $230. 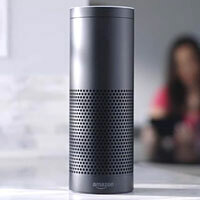 It will use the Alexa voice recognition technology which those with the existing Amazon Echo or Amazon Dot will be familiar with. In a step forward from these existing options, the Echo Show also has a touch screen adding a visual edge to what were previously just speakers. Amazon Echo Show users will be able to see extra information on the screen, as well as watch YouTube videos – and others from elsewhere and see visual results for questions that they have asked Alexa. Users can also shop with their voice, make calls, get news flashes, see their photos and even see music with lyrics. The two Dolby-tuned speakers at the front give a decent quality sound, filling the room. The front facing camera is of good quality and you can even get your compatible security cameras sent to your Amazon Echo Show. Users can call other Echo or Alexis app users, taking advantage of a new feature called 'Drop-In'. The new Amazon Echo Show is the latest offering from Amazon in the highly competitive worlds of smart speakers and home assistants. Having taken the lead in smart speakers as a result of the original Amazon Echo which was released in the US is 2014 and the UK in 2016. The smart speakers use the voice recognition technology lovingly named Alexa. According to e-Marketer, Amazon's Echo devices have eaten up 70.6% of the market – compared to 23.8% which is made up from the Google Home. Although these devices are still not particularly mainstream, their use is on the rise. “Consumers are becoming increasingly comfortable with the technology, which is driving engagement. As prices decrease and functionality increases, consumers are finding more reasons to adopt these devices, "says Martin Utreras - e-Marketer's vice president of forecasting. By continually developing and releasing new devices Amazon are proving that they have their finger on the pulse of where technology is going, as well as its demand, which, of course is excellent for everyone who is involved with Amazon.